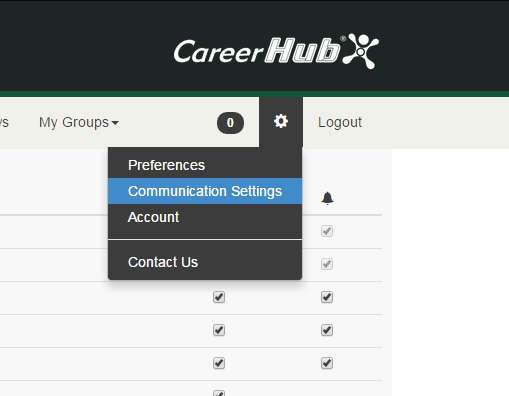 In case you missed it, we recently rolled out a CareerHub update containing a complete overhaul of the user communication settings. The upgrade will give users more control over what type of communications they wish to receive from the team here at Careers and Employment. 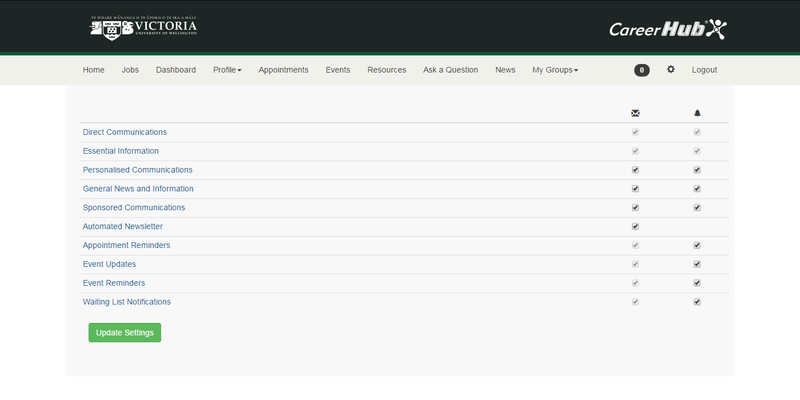 Why not take a look at the new settings by clicking here, or you can navigate to them from within the CareerHub system by clicking on the settings icon on the right hand side of the main navigation bar (next to the logout link as shown in the image below). For those of you that wish to continue or even begin receiving our popular job alerts, please make sure you are subscribed to the ‘Personalised Communications’ email category as this covers targeted jobs, events and information related to your study. Also, in order to ensure you receive the most accurate information, jobs and events, it’s important to keep your preferences up to date! Regardless of whether your subscribed to our emails or not, if we are sending emails to specific study and interest areas and yours are not set, you will not receive them! These can also be found under the settings icon on the navigation bar or by simply clicking here. That pretty much covers it, if you want to find out more information about each of the categories, navigate to the ‘Communication Settings‘ page and click on the category links to launch a pop-up box containing more detailed descriptions. Previous Post Are you going on holiday or going to be ill? Next Post Happy Anniversary, Mr Scrooge!